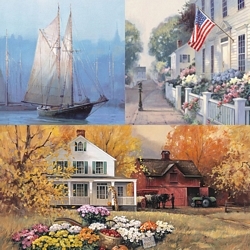 Image Size: 29"w x 18 5/8"h.
Paul Landry's colorful flower images come from the popular artist's own love of gardening. "Yes, spring is here, hoping to fill your heart with the joy of its color and lift your spirit with its beauty," Landry says. "The selection includes petunias, morning glories, dahlias, tulips, daffodils and day lilies, all enjoying the warmth of the sun. Just strolling along the path entices me to get back to the pleasure of gardening again."